I love making a gingerbread house at Christmas time. However, I’m never any good at eating it. When you’ve worked so hard to assemble this work of edible art it’s heartbreaking to have to destroy it. Therefore I thought what about a gingerbread village? Little houses so you could eat them one at a time and not feel bad for destroying your entire creation! So that’s what I did. These have been a labour of love I tell you! I actually made the gingerbread weeks ago but never quite had the time to sit down and get on with putting them together. As a result I ate a bunch of the sweets I had been going to use and there were more than a few breakages and someone, I’m looking at you dad, ate a roof tile. 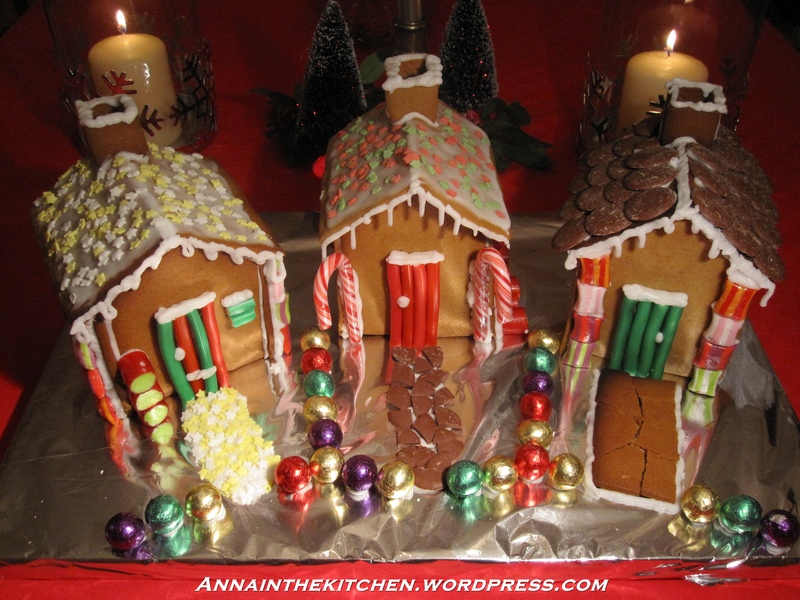 In theory this recipe makes 6 little gingerbread cottages. I got 3. But such is life. This gingerbread dough isn’t perhaps the ideal one you’re looking for to make houses but it does make an excellent biscuit. It spreads a little inconsistently while baking so I got some wonky bits and the dough is easiest to work with while still warm, after that it starts to crack a little while you’re handling it. For that reason I haven’t given you the pattern I used for my houses, but they were about 3″x4″. Next year I’ll be trying a different recipe for my houses but for biscuits to eat or hang on the tree I think this could be a winner. Makes 6 3″x4″ houses or, in theory, 1 large house. Make 1/2 if for biscuits unless you need dozens. – Heat the oven to gas mark 6 and find every baking tray in the house. – Melt together the butter, sugar and syrup in a large pan. – Put the flour, bicarbonate of soda and ground ginger in a large mixing bowl and mix them together. – Pour the melted butter mixture into the flour and mix well with a spoon until a dough is formed. – Cut out your shapes and place on lined baking trays. – Bake for 10-12 minutes watching carefully because it is very easy to burn these. Try to get the houses each on one tray so they’re a consistent colour. – Allow to cool on the trays for 5 minutes until hard then cool completely on a wire rack. – Repeat for the rest of the batches. 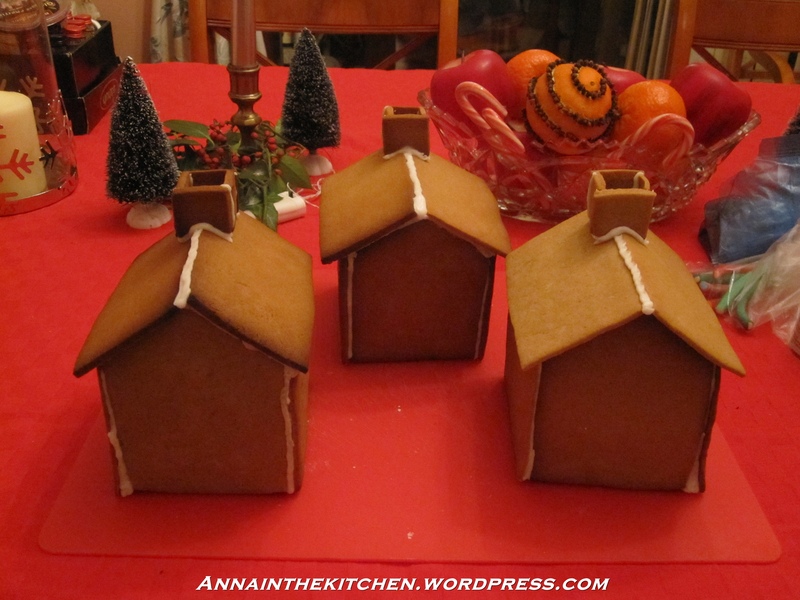 To assemble the houses I use a ‘glue’ made from 200g icing sugar and 2-3 tbsp boiling water. You can use royal icing if you want it to be stronger but this tastes much better. I pipe strips of icing down the edges of the ‘sides’ then carefully press all 4 walls together, you may need an extra pair of hands for this part. Then I allow that stage to dry. Once dried I put on the roof tiles again by piping strips of icing all around the top of the house then very gently pressing down the tiles. Then I pipe a line along the apex. The chimneys, if making, are done in almost exactly the same way. I leave the houses to dry, preferably for an hour, then get on with decorating with sweets using the same kind of ‘glue’ to stick everything on.